More often than not, bicycles are the vehicles of choice in Greg Curnoe’s oeuvre. Car (1967) nonetheless reveals many of his artistic passions. 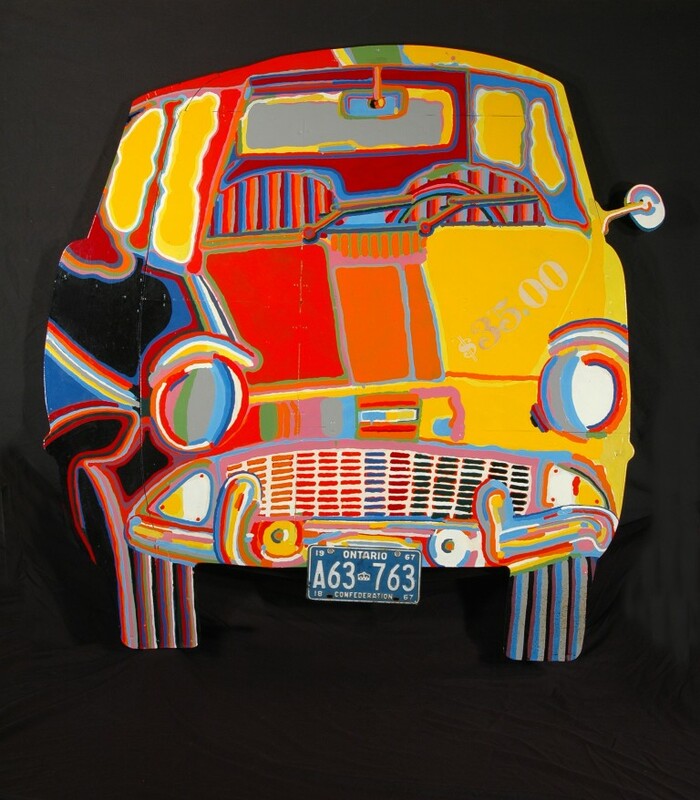 One, for instance, was the making of art that was personal: this car is a portrait of Curnoe’s own car, an English Morris Minor purchased in 1967. A second was an exploration of collage: Curnoe includes a real licence plate and combines paint with metal, masonite and wood. This technique, along with his “everyday” subject matter, reveals Curnoe’s attraction to Dada. A European art movement that championed “anti-art,” Dada heralded works created with and about materials traditionally considered unsuitable for art. Another passion? Translating the aesthetics of comic books to art. A fan since childhood, Curnoe loved their simplified shapes and bold colours, and frequently returned to them for inspiration. Car emerges from an especially productive time in Curnoe’s career. Between 1960 and 1967, Curnoe had already founded and laid to rest an arts-based periodical (Region magazine); organized the first “Happening” in Canada;1 helped form an iconoclastic band (Nihilist Spasm Band); co-founded a gallery (Region Gallery); received his first Canada Council grant; and saw his work purchased by two established Canadian galleries, the Art Gallery of Toronto (now AGO) and National Gallery of Ontario.